I’m always dubious when a new product arrives on the market claiming that it can give me thicker or bigger hair. Usually I notice no difference and I regret wasting my money. The newest contender on the market is the L’Oreal Elvive Fibrology range. The Shampoo and Conditioner are a reasonable €3.49 each and its tagline is “Hair looks and feels thicker, with visible body & bounce”, so far, so good. But did it live up to the hype? I’ve been using both the shampoo and conditioner for the last few weeks and I like the results so far. I will continue to use it as the Filloxane in it is designed to continue to thicken the hair wash after wash. It also claims that once you discontinue use that your results will last for up to ten washes with normal shampoo. While they weren’t exactly life changing products, as the bottle would lead you to believe, I did notice a difference.They left my hair with a nice clean, fresh smell. Not that shampoos and conditioners normally don’t, I just noticed it a lot more with this one and I much preferred it to the ones I was using previously. It left my hair with a nice healthy shine to it and a noticeable boost. My hair doesn’t look as flat as it did before I started using it and there is more volume to it. All in all I’m pretty happy with this shampoo and conditioner. It’s certainly far better than its predecessor and I’m intrigued to see if it keeps getting better with every wash considering I’ve already noticed a definite difference. I started using them with low expectations but was pleasantly surprised. 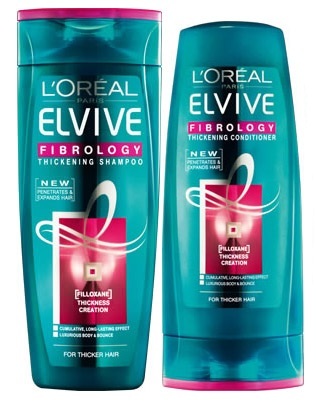 If you are looking to give you hair a bit of a boost then L’Oreal Elvive Fibrology Shampoo and L’Oreal Elvive Fibrology Conditioner are the products for you.